Smithsonian Arts and Industries Building in Washington, D.C. The Arts and Industries Building was the first building created solely to house the US National Museum. The museum’s collections had been housed in the Smithsonian Institution Building, or Castle since the 1850s, but had soon outgrown that space. 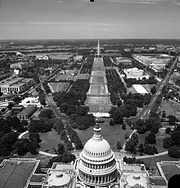 Smithsonian Secretary Spencer F. Baird devoted his career to developing a great US National Museum at the Smithsonian, and this building was the culmination of his dreams. 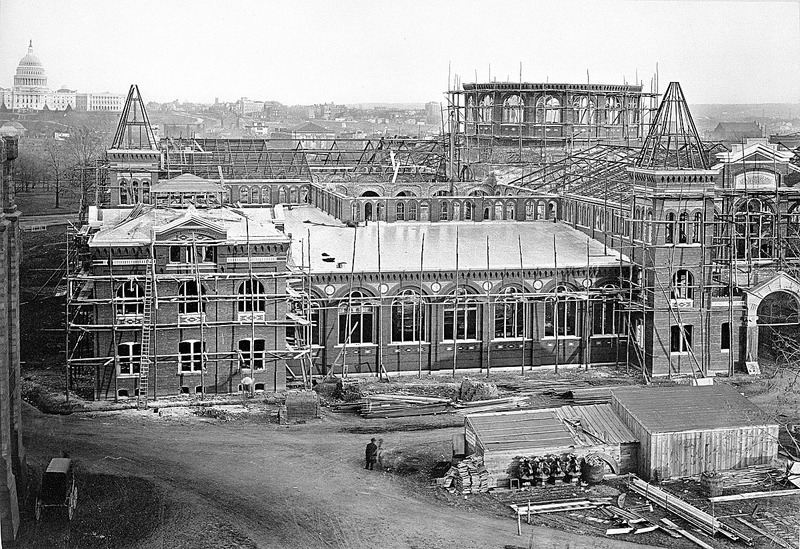 After the Centennial Exposition of 1876 in Philadelphia, many of the displays were donated to the Smithsonian, and some of the proceeds from the exposition were used to build a new museum building. After an architectural competition, the Board of Regents selected the architectural firm of Adolf Cluss and Paul Schulze for the new building. Secretary Baird, General Montgomery C. Meigs, General William Tecumseh Sherman, and Congressman Peter Parker composed the National Museum Building Commission which oversaw the project. General Meigs, a civil engineer educated at West Point, supervised the structural system and conducted a study of public museums in Europe. On April 17, 1879, ground was broken for the new museum building to be located next to the Castle. The building design is symmetrical, composed of a Greek cross with a central rotunda, with an iron truss roof. The exterior façade has geometric patterns of polychrome brick. Above the north entrance is a sculpture entitled Columbia Protecting Science and Industry by sculptor Caspar Buberl. The interior of the building is partially lit through the use of skylights and clerestory windows, complemented by electrical lighting throughout the building from when it opened. The foundations and main walls were completed during the first year of construction. 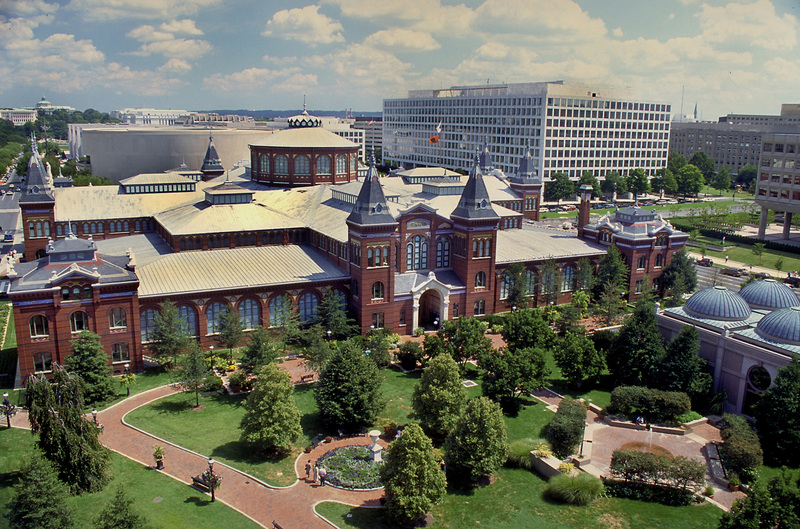 By the end of 1880, the roof had been completed and parts of the building were already in use by Smithsonian Institution staff. The first event held in the new building, before the exhibits and a permanent floor were installed, was the inaugural ball of President James Abram Garfield and Vice President Chester A. Arthur on March 4, 1881. 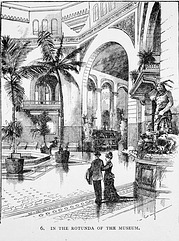 The US National Museum opened to the public in October 1881. Initially the ground floor was completely devoted to exhibits. Mahogany exhibit cases were used as the partitions between seventeen separate exhibits areas. A wide range of exhibits were on display including geology; metallurgy; zoology, which was known for its quality of taxidermy and animal exhibits; ethnology; comparative technology, a study of everything made or consumed by mankind; navigation; architecture; musical instruments; and historic relics, which included the personal effects of George Washington. By the 1890s, the museum’s collections had already outgrown the new building, and a new US National Museum building, now known as the National Museum of Natural History, opened in 1910 across the National Mall. 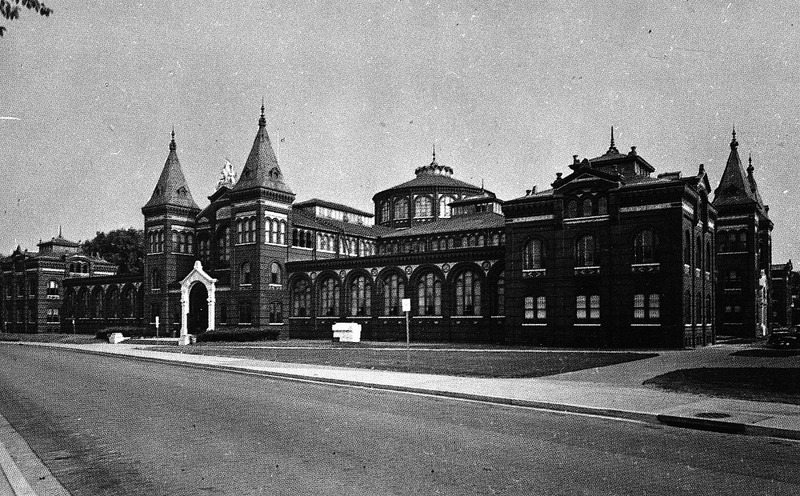 The old US National Museum Building was renamed the Arts and Industries Building in 1910, when the natural history collections were moved to the new US National Museum. For the next fifty years, it showcased the American history, and history of science and technology collections. Notable among its treasures were the Star Spangled Banner, the Spirit of St. Louis, and the first display of the First Ladies Dresses. At the end of World War II, the small collection of airplanes in the Arts and Industries Building and in the aircraft building in the South Yard received status as a separate museum, when the National Air Museum, now the National Air and Space Museum, was established on August 12, 1946. During the 1940s and 1950s, an Exhibits Modernization Program produced sleek new exhibits throughout the building, generating new interest in the collections and leading to legislation for a new history museum. In 1964, the remaining historical collections in the Arts and Industries Building were moved to the new Museum of History and Technology, now the National Museum of American History, and the National Air Museum took over the rest of the building. The Air Museum remained in the building until its own building opened in 1976. In 1971, the Arts and Industries Building was designated a National Historic Landmark. 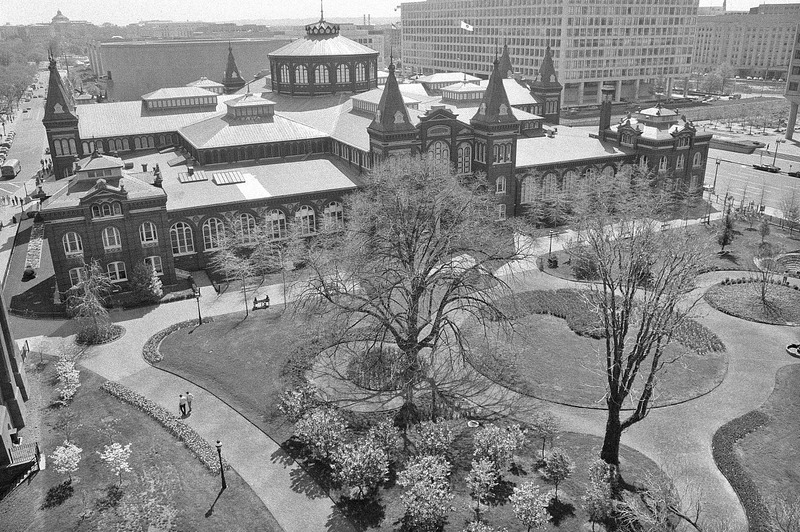 The building was closed from 1974 to 1976 for renovation and reopened with 1876: A Centennial Exhibition, which displayed many of the original objects from the Philadelphia Centennial in the building built to house them. A Victorian Garden was created in the South Yard that adjoined the building’s west side. In 1981, an experimental sensory garden for handicapped visitors was developed on the east side of the building, and in 1988 it was renovated and named the Mary Livingston Ripley Garden. In 1979, the Discovery Theater, aimed at a young audience, began production in the building. 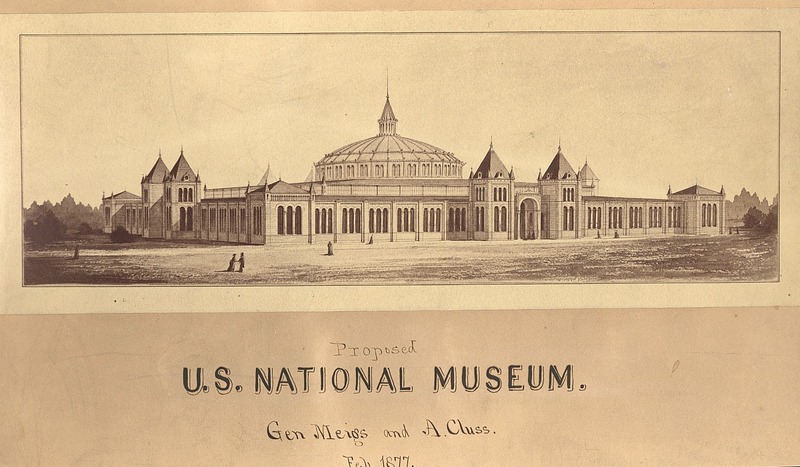 After the 1876 exhibit closed, the building served as a venue for temporary and experimental exhibits, including the inaugural exhibits for the National Museum of the American Indian. In 2006, the Arts and Industries Building was named as one of America's Most Endangered Places by the National Trust for Historic Preservation and the building was closed due to its deteriorating condition. In 2009, it received funding through the American Recovery and Reinvestment Act of 2009, and is currently undergoing renovation.